* Raúl Hernández, who originally was to perform the role of Ferrando is unable to perform. Alternatively, Takahashi Jun is going to take his place. Please refer to New National Theatre News. Available from Sunday 20 November, 2005 at 10:00am. Do all women behave like this? An ensemble of popular singers will superbly play women with a wavering heart. 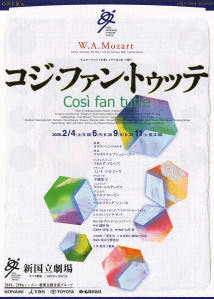 Together with Don Giovanni and Le Nozze di Figaro, Così Fan Tutte (All Women Behave Like This) is the last of what is known as Mozart's Da Ponte trilogy. Behind the simple comedy in which two pairs of lovers swap their partners is a sharp insight into the subtleties of the feelings of men and women, as well as the true nature of human beings and their foolishness. Well-balanced elegant ensembles, including duets, trios, quartets and quintets, which express a mixture of delicate sentiments, could be said to be the ultimate in Mozartian opera. Fine music that cleanses the soul of the listener permeates the entire opera. The officers Guglielmo and Ferrando are engaged to the beautiful sisters Fiordiligi and Dorabella, respectively. Persuaded by the wise old philosopher Don Alfonso, the two officers decide to test the fidelity of their sweethearts. They pretend that they have been ordered away by their regiment and bid the sisters a false farewell. Later, disguised as Albanians, the two men court Fiordiligi and Dorabella passionately. The two girls weaken little by little to the Albanians' various advances. First, Dorabella yields to her sister's fiancé Guglielmo, and finally, Fiordiligi also succumbs to Ferrando after much resistance. When a double wedding for the two new couples is being arranged, a military march suddenly signals the return of the army.